Children and youth in Liberia are learning to heal and hope in Christ through Active Fellowship. Kumba, 17, still has bullet fragments in her leg from when she was shot at age 10; she also has many emotional wounds caused by the husband who abandoned her and the death of her newborn two years ago. Kumba’s inner strength comes from her faith in Jesus Christ. Through Active Fellowship she has learned to rely more on Him. But these difficulties fade for a little while as she learns to laugh and play again—without fear. She’s enjoying her day in the sun with 350 other youth at a tournament put on by Active Fellowship in Ndehuma, Liberia. This Samaritan’s Purse program is an avenue to disciple and mentor Liberian youth through physical activity and through Bible study. In addition to track and field and other sporting events, Active Fellowship offers dozens of games that specifically teach life skills such as hygiene, respect, conflict resolution, and recovering from trauma. The contact, exertion, fun, and competition of the events stimulate children to begin processing the many issues they face. Relational walls come down and young people can face their fears in a productive way. Our Samaritan’s Purse staff then come alongside to point them to the transforming love of God and the power of the Gospel in their everyday lives. Activities like jumping rope give children fun ways to learn life skills. Youth from the green team cheer on teammates in this friendly competition. The freedom of running during an Active Fellowship sporting event! The battle of tug-o-war on this field actually brings kids and families together. The older youth are ready for the next exciting challenge. At the end of their rope and loving it at an Active Fellowship tournament. The young men who come here are battling to win and to heal from a lifetime of wounds. Struggles within and without are real, but so is the rest they receive in Christ. The best friends are those you make in the fight. This is what victory looks like at Active Fellowship. Through this project of Samaritan's Purse, Kumba found freedom in Christ from the pain of her past. Joseph discovered the value of sports-related ministry after starting such a program for refugee children in the camp where he lived for five years during the Liberian Civil War. He’s worked with our Active Fellowship program for six years and has seen countless children move past stigma and fear and find healing—first through the power of play and then, more solidly, in the life-changing message of the Gospel of Jesus Christ. 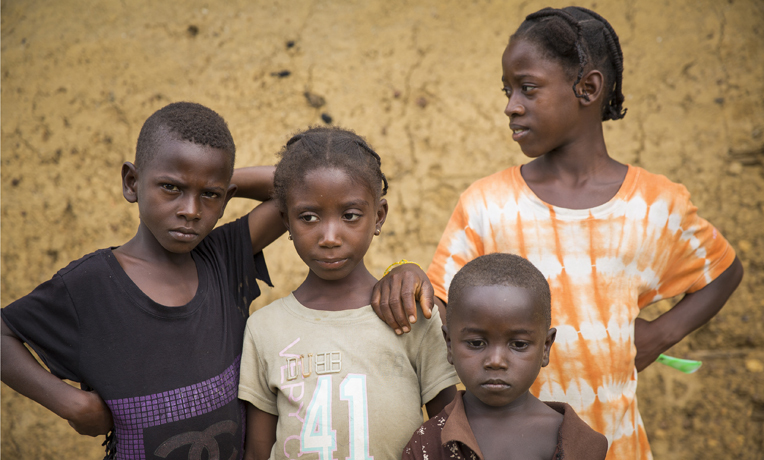 In recent years, the program has had great impact in Ebola-affected communities. As a part of the curriculum, children who lost loved ones during the Ebola crisis have been taken through Biblically-based material for healing after trauma. Silences have been broken, grief has been dealt with in a positive manner, and seeing children playing again is an encouragement to everyone. Kumba has developed her life skills through the program. She’s also embraced a Biblical perspective that helps her maintain a joyful heart no matter what circumstances she’s facing. Through Active Fellowship, children in Liberia are learning to “run with endurance the race that is set before us, looking unto Jesus” (Hebrews 12:1-2). Our team has seen her come out of her shell over the past year as she’s discovered what it means to be part of a community. The program has allowed Kumba to make lots of friends and meet youth from other regions during competitions. As Kumba has experienced the love of God’s people and the transformation found in the truth of God’s Word, she’s gained a new outlook on her painful past. As she’s grown in faith she has learned to believe God and trust in His plans for her future. Now she is able to forgive those who have hurt her and to turn to Jesus as a friend who will never leave her nor forsake her.